Pattaya is a family-friendly place. I know I know, it may not seem to be a typical family holiday destination, but please stay with me. I was apprehensive too about Pattaya’s seedy reputation at first but after much research, I realised that not all of Pattaya is made for bachelor parties gone wild. True, Pattaya possesses many sides, and one of them is very suitable for children. Alright, so this is the biggie - the one place the monkies made me consider Pattaya as a holiday destination when they saw its commercial being flashed on the Cartoon Network channel. Truth is, I did not know Pattaya is renowned for its numerous gargantuan water parks! Splashdown Waterpark Pattaya offers a 'Wipeout-style' of water-based adventures and activities including the world’s tallest inflatable water slide while the Water Park at Pattaya Park promises a fun day out at its giant Water slides, whirlpool or just lazing on its private beach. Of course, in terms of providing the ultimate family entertainment, the world’s first Cartoon Network themed waterpark takes the cake. Newly opened, the Cartoon Network Amazone Waterpark features a plethora of colorful and thrilling rides, and lovable Cartoon Network mascots such as the Powerpuff Girls, Ben 10 and Adventure Time characters roaming around! There are ten entertainment zones to choose from - catering to the both young and older kids - and there are also live shows throughout the day to keep everyone entertained. This beautiful and enormous wooden temple is an all-wood building filled with sculptures based on traditional Buddhist and Hindu motifs. The building was constructed according to ancient Thai ingenuity and every square inch of the building is covered with wooden carve sculpture. In fact, it has taken 30 years to build and is still a work in progress! The sprawling park at Nong Nooch Tropical Botanical Garden can easily make an all-day trip as it offers a little bit of everything for everyone. The entire area is more like a theme park, with daily cultural shows, restaurants and even accommodation as well as individually themed gardens. Stroll leisurely through the botanical park among its many famous gardens, including its 17th-century French garden, Stonehenge, and European Renaissance garden. Equally fascinating are species-specific gardens, such as cactus and succulent plants, orchid nurseries, tropical palm gardens, bonsai and topiary garden. Other activities include a mini zoo, paddle boating, and cycling. Also known as 'Four Regions Floating Market', the bustling hive is separated into four sections - each representing and selling items from the four major parts of Thailand (north, northeast, central and south). Hire a man-powered boat to get around and visit the many water vendors selling authentic Thai food, desserts and specialties from all over the kingdom. Contrary to popular belief, Pattaya is not all beach and sun. There are plenty of indoor attractions suitable for families but in terms of offering education value with a dose of fun, the many museums in Pattaya are your best bet! At the Royal Garden Plaza, visit Ripley’s Believe It or Not Museum, where kids can learn surprising facts, see unbelievable sights, and even ride on its famous 3D haunted house ride. Get lost in the Infinity Maze, take on the Laser Maze Challenge or meet celebrities at the Louis Tussaud’s Waxwork Museum. Kids will also love the Pattaya Bottle Museum on Sukhumvit Road where they will discover an assortment of ships and letters curiously stuffed into bottles and later found on the beaches. In need for something cuter? Stop by the Teddy Bear Museum which is home to 1,000 stuffed animals and go on a most unexpected journey through history and fantasy. If you fancy some island-hopping, Koh Larn makes for a great day trip for the whole family. Lying just 7km off the coast, the island sports 6 beaches and offers visitors a bounty of beautiful sandy beaches, clear water, incredible scenic views, and stunning sunsets. There is a multitude of activities for families to enjoy on the island, including parasailing, jet skiing, hiking, swimming, banana boat, fishing, snorkeling, and scuba diving. There are two ways to reach the island: by ferry, the trip to Coral Island takes 45 minutes, or a speedboat takes 15 minutes. Here's a TIP: Travelling with kids to Pattaya need not having all of the activities tailored to the kids. 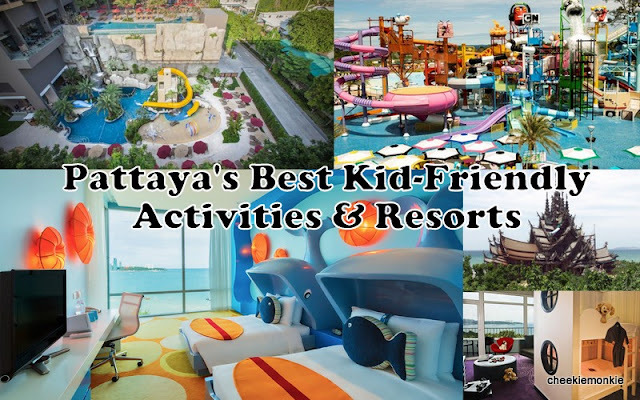 A lot of the family-friendly Pattaya resorts (more on them further down in the post) offer babysitting services so that parents can enjoy a worry-free holiday and spend some time away from the kids too. So parents can sneak away to indulge in some of the more adventurous activities that Pattaya has to offer: go off-roading with ATV Pattaya Jungle Adventures, scream at the top of your lungs by leaping off with Pattaya Bungy Jumping, or blaze the tracks with Pattaya Kart Speedway! 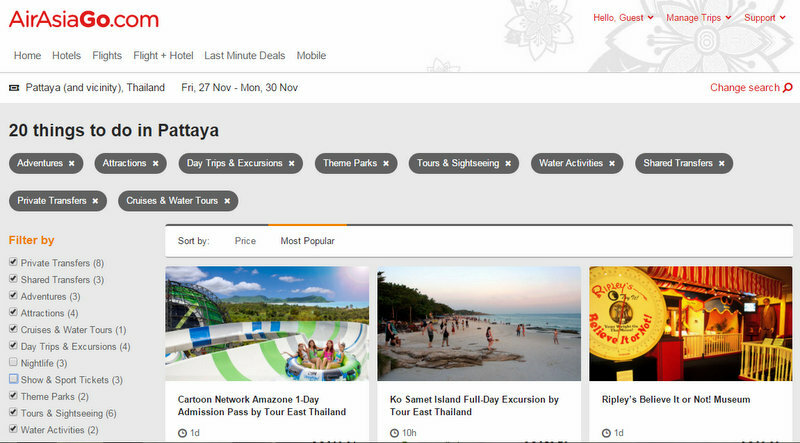 SO are you all pumped up to plan your next beach holiday at Pattaya? I know I am... and the monkies too, especially since I let slip that AirAsia will be flying DIRECT to Pattaya come 27 November 2015 four times a week! Did you know that it is the ONLY airline which will be offering a direct connection between Singapore and Pattaya? And even better - you can enjoy promotional fares from S$39 one way. If you are looking for transfer service, look for either Pattaya-Downtown-Central Festival Plaza or Rayong Plaza under destination in AirAsia.com and it only costs S$9 per way! How's that for fuss-free planning? And even even better - book your flight tickets together with your accommodation through AirAsiaGO.com to enjoy even MORE savings! How much more, you ask? Up to 33% in savings! AirAsiaGO is able to offer substantial savings as it has an exclusive tie-up with AirAsia, ensuring that their flights & hotel packages are priced attractively and competitively in the market. Quite simply, other competitors do not get the same exclusive flight deals from AirAsia, so what this means is travellers will be able to book everything they need in one site - rooms to meet every budget, ground transfers, activities and travel services to complement - all at one competitive price! 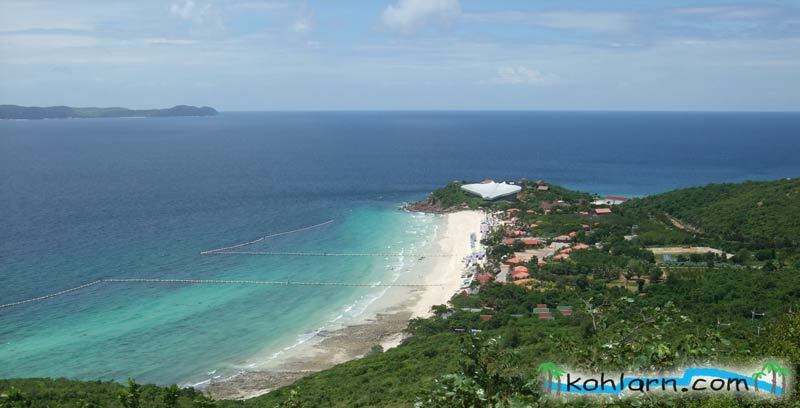 In fact, a quick search on AiAsiaGO for activities to do in Pattaya threw up so many options! Which meant that I could bundle my flight and hotel bookings together with the ground activities at Pattaya. What a time-saver! Booking with AirAsiaGO is extremely hassle-free and ridiculously easy. All you have to do is to enter your travel dates and let the search engine do the work for you. Select the desired hotel and rooms (with or without breakfast), and it's all done! Besides the usual room taxes, there are NO additional booking or credit card fees to pay. Billed as the most child-friendly hotel in Thailand, Centara Grand Mirage Beach Resort Pattaya has its own full-scale 'Lost World' full-scale water park! Think two gigantic cliffs connected by rope bridges, a cavern that reveals a jungle with a river and waterfalls, complete with splash-tastic slides, cooling pools with inflatables and direct access to a stretch of sandy beach. Family units include brightly-coloured rooms with bunk beds and packs of child-friendly toiletries. The fresh and funky Holiday Inn Pattaya offers spacious rooms and suites, all of the amenities guests need to relax and feel at home, and scenic ocean views. Besides playing themselves silly at the Kids pool or at the free Kids’ Club, kiddos will go ga-ga over having the opportunity of snoozing in the mouth of a whale in the Ocean View Family Suite, which comes with connecting Parent and Child rooms! Newly opened in November 2014, Mercure Pattaya Ocean Resort is located in the prime location of North Pattaya offering direct access to the beach just 500 meters away. Accommodation and breakfast is free of charge for 2 children under 16 years (sharing parents’ room and utilising existing bedding) but the real draw for kids has got to be its mini Water Park, Kids Club and rock-climbing facilities! If you have a mix of young kids with teenagers, Hard Rock Hotel Pattaya is perfect as it offers a range of amenities – with the franchise’s signature rock and roll vibe. Go for the Family Suite which comes with bunk beds, video games, beach toys, junior bathrobes and toiletries for the kids. In addition to the Lil’ Rock Kids’ Club which features babysitting services, crafts, games and movies, kids will revel in the beach-sand pool area. And all ages (even parents) will enjoy the Family Foam Party by the pool every Saturday evening! Time to grab those passports, no? Starting 27 November 2015, AirAsia flies direct to Pattaya from Singapore 4 times a week. For more information and to book, visit airasia.com. 1.Did you and your family fly from Singapore to Pattaya directly? The only direct flights I searched for at airasia are at night. 2. Are there registered taxis at the UTP airport? Would be grateful for your help. Thanks a mil. 1. Yes, we took that AirAsia flight. Currently, AirAsia is the only airline that flies direct from SG to Pattaya. 2. There are more vans, rather than taxis at the airport upon our arrival. There are a few transfer service shops at the arrival gate of the airport which offer hotel transfer. The fee depends on the hotel you stay, and passengers will be grouped according to the area of hotels that they stay in, and dropped off accordingly. Thanks so much. Would you happen to know the cost from the airport to the Grand Centura Mirage by one of these vans? Unfortunately, I do not know as AirAsia handled the airport transfers for us. But from what I read online, a taxi journey from the airport to Pattaya town costs about 700-800 Baht. Hi, is your travel date too far away? Perhaps Air Asia has not opened those dates for booking yet. I have the same issue too. I tried to book SIN - Pattaya but whichever dates i put, even if it is just one month away there is no flight at all. Maybe Airasia has taken it off. I tried to live chat with them but it's so hard to talk to their customer service. Its sch holiday soon always nice to read up ur blog on vacation. 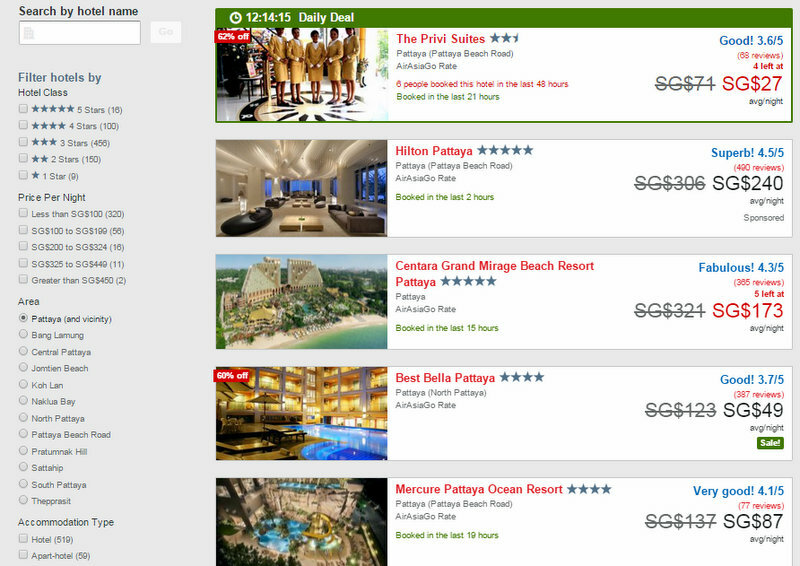 We're going to pattaya staying holiday inn pattaya and centara grand mirage after reading up info from ur blog. Can you recall how you get hotel transfer between hotel there? Hi Kelynn, thanks for your support! We got the hotel to help us call a cab.